On January 6, 2016, Netflix announced that it will be expanding its popular video streaming services to 130 new territories. Included in the expansion is the Philippines. The company stayed true to its promise back in September 2015 that it will expand into Southeast Asia in early 2016. Below is an overview on how you can watch Netflix movies and shows in the Philippines. Step 1: Register with Netflix. This is very easy to do. Just go to the Netflix website and click on the tab that says "Register". If the company is currently running a promo, you will see a tab that says "Start Your Free Month". Just follow the tab to proceed. Step 2: Choose your Netflix plan. In the Philippines, you have three options - Basic, Standard, and Premium. The Basic plan will cost you 370 pesos a month, the Standard plan 460 pesos a month, and the Premium plan 550 pesos a month. Below is an overview of the differences between the three plans. We highly suggest that you choose the Premium plan. 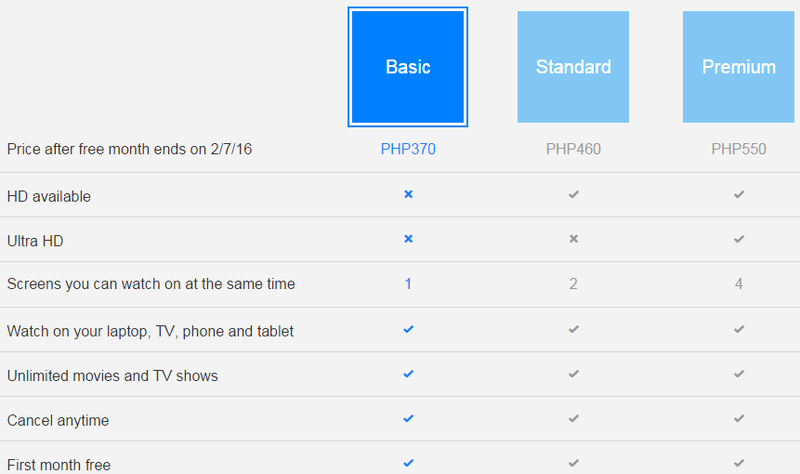 The difference in price compared to the Basic plan is only 180 pesos. With the Premium plan, you can watch four Netflix programs in four screens all at the same time. And you can watch the shows in Ultra HD. You get all of these perks by adding a mere 180 pesos on top of the Basic plan. Step 3: Create your account. All you need to do is enter your email address then create a password. After this step, you will then be asked to choose your payment method. You can either pay via credit card or via PayPal. Step 4: That's it! You can start watching the shows and programs in Netflix's inventory. 1) If you register with a free month trial, be assured that you won't be charged until your first month expires. If you don't want to be charged or you don't want to continue with the service, just go to your account and click on the tab that says "Cancel membership". 2) You can watch Netflix in the Philippines using several devices. These devices include Smart TV, Blu-ray player, smart phones, tablets, PlayStation, desktop, laptop, Xbox, and Apple TV. 3) When you log into Netflix, there's a search box where you can find television shows and movies that are available for streaming. Always keep in mind that shows put on Netflix won't be there indefinitely. Sometimes they get taken down, then added back, then taken down again.